Malaysia and Vietnam on Saturday led a search for a Malaysia Airlines jet that has gone missing over Southeast Asia, as fears mounted over the fate of the 239 people aboard.Vietnam authorities said contact with Flight MH370 was lost near its airspace, but its exact location and what happened to it remained a mystery 12 hours after it slipped off air-traffic control screens.Malaysia Airlines said the plane, on an overnight flight from Kuala Lumpur to Beijing, relayed no distress signal, indications of rough weather, or other signs of trouble. "The plane lost contact near Ca Mau province airspace as it was preparing to transfer to Ho Chi Minh City air traffic control," a statement on the official Vietnamese government website said.Its signal never appeared to Ho Chi Minh City controllers, it said. Ca Mau province is in southernmost Vietnam, next to the Cambodian border.Vietnam's defence ministry has launched a search for the plane, the statement added.Malaysian authorities also dispatched a plane, two helicopters and four vessels to search seas off its east coast in the South China Sea, said Faridah Shuib, a spokeswoman for the Malaysian Maritime Enforcement Agency.The Philippines said it was sending three navy patrol boats and a surveillance plane to help efforts.- Contact lost 2hrs after take-off -Contact was lost at 2:40 am Malaysian time (1840 GMT Friday), about two hours after take-off from Kuala Lumpur International Airport, the carrier's CEO Ahmad Jauhari Yahya said. "Our focus now is to work with emergency responders and authorities, and mobilise full support," he told a press conference in Malaysia. "And our thoughts and prayers are with all affected passengers and crew, and their family members. "Screens at Beijing's airport indicated at first that the flight was "delayed", but later updated its status to "cancelled".Whatever happened to the flight, Indonesia-based independent aviation analyst Gerry Soejatman said the clock was ticking on a "24-hour golden window" for search and rescue efforts. "You can’t assume that there are no survivors, and if there are any, it is absolutely crucial that they are picked up within a day, or the chances of survival drops significantly,” he said.The Boeing 777-200 carried 227 passengers and 12 crew members, from 14 nationalities Ahmad Jauhari said.They included 153 Chinese nationals including an infant, 38 Malaysians, and 12 Indonesians, he said.Six Australians also were aboard, along with three French nationals, and four Americans including an infant.Malaysia Airlines has a good safety record. 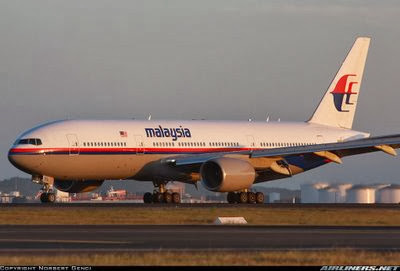 Its worst-ever crash occurred in 1977, when 93 passengers and seven crew perished in a hijacking and subsequent crash in southern Malaysia.The pilot of the missing flight MH370 is Captain Zaharie Ahmad Shah, 53, who has flown for the airline since 1981, the carrier said. Its first officer Fariq Abdul Hamid, 27, joined the airline in 2007. The plane is more than 11 years old.The flight path of the Kuala Lumpur-Beijing route passes over the South China Sea and the Indochinese peninsula before entering southern Chinese airspace. "This news has made us all very worried," Chinese Foreign Minister Wang Yi said in Beijing. "We hope every one of the passengers is safe. We are doing all we can to get more details. "Chinese and Thai authorities have said the plane did not enter their airspace.- Distraught relatives -The information vacuum regarding the flight touched off a frenzy on social media, which saw an outpouring of concern for passengers.At Beijing airport where authorities have gathered the passengers' families at a nearby hotel, an AFP journalist saw one woman enter the arrivals zone and break down in tears. She was led away by police.At Kuala Lumpur International Airport, family members looking sombre and distraught trickled in to a designated waiting area for loved ones, escorted by authorities. "They gave us no information so far," complained one man, who said his niece and her husband were on the flight for a one-week holiday in China. Reporters were barred from entering the area.The Boeing 777 also has a solid safety record, with only a handful of incidents since its introduction in the mid-1990s.In July 2013, three people died when a Boeing 777-200 operated by South Korea's Asiana Airlines skidded off the runway upon landing at San Francisco's international airport after it clipped a seawall before touching down. "We're closely monitoring reports on Malaysia flight MH370. Our thoughts are with everyone on board," US-based Boeing said in a statement on its Twitter feed.An accident would be a huge blow for the carrier, which has bled money for years as its struggles to fend off competition from rivals such as fast-growing AirAsia.The flag carrier recorded its fourth straight quarterly loss during the final three months of 2013, and warned of a "challenging" year ahead due to intense competition.It admitted in 2012 it was in "crisis", forcing it to implement a cost-cutting campaign centred on slashing routes and other measures.